Make your home bigger without adding square footage: How renovations can boost your usable living space - Draft On Site Services Inc.
Our interior designer at Draft On Site is someone who knows, and loves, space planning. One of our favourite topics with our renovation design clients is how to make their homes feel larger, without adding square footage. Doing so takes skill, an outside-of-the-box approach and a very good eye for detail. Truly, an innovative use of space can make your home feel larger without additions. Our interior designer can help you find space, even where it might seem none exists. The trick to great renovation design or interior design, is the ability to visualize spaces, light, flow and ambiance. Therefore, adding more space to your home can be done with simple esthetic changes, rather than adding on. In homes large and small, storage can be a difficult element to make space for. Yet for creating a sense of increased space, storage is one of the most important parts of your home. Adding storage creatively can not only make your home feel larger and more comfortable, it can be a multi-purpose, attractive solution. 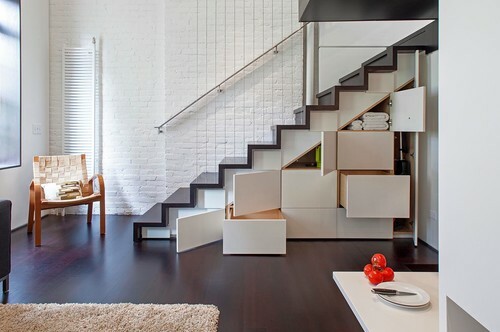 Building in drawers under a staircase eliminates wasted space, looks clean and adds plenty of room for your belongings that need to be accessed easily from a main area in the home. In this example, a minimalist look and clean lines help reduce clutter for a seamless finish. When you closet just doesn’t cut it, there’s still lots of opportunity for bedroom storage, like in this example. Mudrooms tend to be spaces where things get thrown aside and rarely organized. Cleverly planned open storage makes it easy to stay tidy, and keep more things organized in less space. Often, adding windows and moving doors is all it takes to make your home feel larger. When planning your home’s new look and feel, our renovation designs account for the sun’s position, the location of trees or other obstructions outside, and your home’s structural integrity. With those elements in mind, our renovation designer might suggest adding or changing the position and design of your windows to add more light to a room. More light can give your home a brighter, more open feel. The removal of non-structural, or non-load-bearing walls from inside your home can work wonders to open up the space and create a seamless flow from room to room. This is the idea behind open-concept interior design. When multiple rooms are combined into one, the area feels larger. For families, open-concept (or broken-concept) layouts are ideal for keeping an eye on the kids and entertaining guests, for example. Another method of creating space within a home involves raising your house’s ceiling. This is particularly useful in homes with 8 foot ceilings, which can seem dark and cramped because of the limited space overhead. High ceilings give the illusion of more floor space within a home, and can make your home seem more open and airy. On certain types of homes, our designer might suggest raising your ceiling throughout the house, when possible, and can create renovation plans around your new, taller rooms. Another option is vaulted ceilings, which can be discussed with our designer as well. You can see some of our interior design projects for inspiration, or call if you’re thinking of renovating – 604-876-3738. We can talk you through some of the best options to make your home feel bigger with a minor renovation.